Sterling silver snowflake earrings add a cool sparkle to your winter wardrobe, whether you wear them to a glitzy holiday party or out and about town in casual attire. 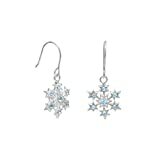 Wearing snowflake earrings creates a festive feeling during the winter season. These lacy and pretty earrings bring to mind crisp, cold, invigorating air with sparkling snowflakes gently floating to earth. 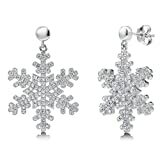 A pair of sterling silver snowflakes can be the perfect accessory for your winter wardrobe. These earrings can be very simple, or more ornate; made of just sterling silver, or have additional sparkle and color from gemstones, crystal, or glass beads. 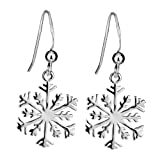 For the most part, sterling silver snowflake earrings are quite affordable. Here are a few that I especially like. In nature, no two snowflakes are alike. However here you'll find perfectly matched pairs of sterling silver earrings to complement your winter attire, whether you're attending a glitzy, gala holiday party, or running errands around town in your favorite jeans. Sterling silver is an alloy (mixture) of silver and other metals such as copper. Silver makes up 92.5% of the mixture, and the other metal makes up the remaining 7.5%. Silver by itself is too soft for most uses, including jewelry, so a small percent of another metal is added for strength and durability. Copper is usually used because its addition doesn't affect the beautiful color of silver. 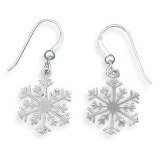 Sterling silver is a perfect material for high quality jewelry, including these beautiful snowflake earrings, giving them durability and a sparkle that's pleasing to the eye, while still keeping them affordable. These lacy, delicate-looking sterling silver snowflakes with French hooks are what I wear many days during the winter, and I've received many compliments on them. I've also given these beautiful earrings as gifts to relatives. They can be worn for festive occasions, or just around town. Snowflake diameter is a little over 1/2 inch, and length is about 3/4 inch. Glittery modern pattern, made of sterling silver. These earrings have been laser etched, which makes them sparkle and shimmer like freshly fallen snowflakes. The photo here doesn't show the sparkle, but the enlarged image on the product page gives a better idea of how they glitter. They're light-weight, but sturdy. Snowflake diameter is about 7/8 inches. French hooks. These sparkling earrings are made of sterling silver and plated with rhodium to minimize tarnishing. Each earring has multiple cubic zirconia stones for brilliance and sparkle. Earring length is about 1 1/4 inch. These would go well with a special holiday dress. Cubic zirconia stones add a special sparkle, but at a more affordable cost compared to diamonds. A bit of color is added to these dainty and delicate sterling silver snowflake earrings with cool blue sparkly Swarovski crystals. Snowflake diameter is about 0.5 inch, and hangs from a french wire. Each earring has seven icy blue crystals. These would be lovely for a winter wedding. These sterling silver earrings are special because of the 12k gold rose leaves in the center. They come with a white leatherette box, and a certificate of authenticity. Black Hills jewelry is made in the Black Hills of South Dakota. Did You Notice That All of These Earrings Are Six-Sided? Snowflake crystals in nature are 6-sided -- never 4 or 5 or 8-sided. You can buy snowflake jewelry that has 4, 5 or 8 points, but I think the 6-sided snowflake jewelry is more aesthetically pleasing. That's why I chose only six-sided snowflake earrings to feature on this page. If you're interested in learning more about how real snowflakes are formed, why they have 6-sided symmetry, and what other shapes they take, visit How Are Snowflakes Formed. Collectible snowflake ornaments for decorations and gifts. Includes Lenox, Wedgwood, Swarovski, and more. Snowflake forms are determined by the weather conditions in which they form. Only some snow crystals are six-sided. Others may be needle-shaped, columnar shaped, or more commonly have chunky irregular forms. Instructions how to fold and cut paper to make your own six-sided paper snowflakes. Physicist Kenneth Libbrecht is one of the top researchers and photographers of snowflakes. You can buy his snowflake posters and books with more information and images of snowflakes. These are perfect all winter long. I love them. They are festive without being a santa or reindeer on your ears. Which for my style is a bit much! I like them! The top one is my favorite. Physicist and photographer Kenneth Libbrecht studies how snowflakes are formed and photographs them. You can find his beautiful snowflake images in books and on posters. Sterling silver earrings for are the perfect pair of earrings matching anything. Learn about the care and keeping of silver and why its such a good choice for earrings.